Enterprise and midsize businesses are increasingly turning to blade servers as the platform of choice to deliver the next generation of virtualized appli-cations. Blade servers can yield significant cost efficiencies over rack servers — while taking up a smaller footprint, consuming less power and providing significant advantages in terms of manageability, scalability and flexibility. 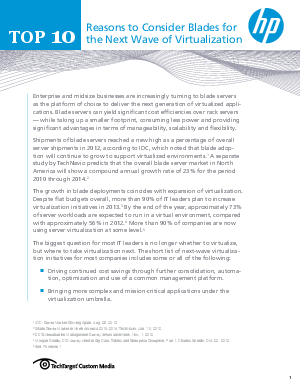 The biggest question for most IT leaders is no longer whether to virtualize, but where to take virtualization next. The short list of next-wave virtualiza-tion initiatives for most companies.